This gorgeous white floral lace garter set features a delicately embroidered white organza, double layered floral lace with a white elastic band. 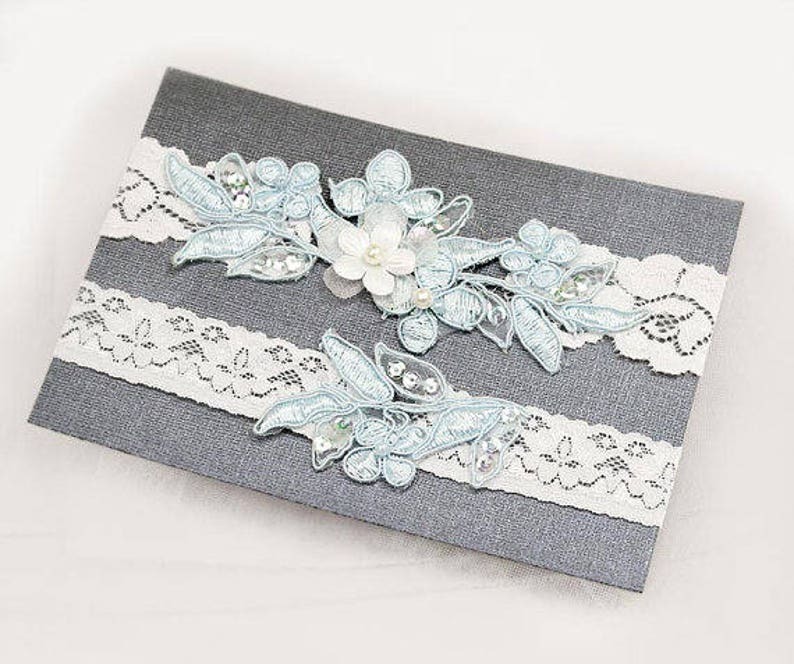 First Picture is a light blue applique with an white lace band. ** Note: If you want "other color lace applique(4th picture)",please let me know in the "Note to seller" box at check out. Measure the circumference of your thigh at the exact place where you will be wearing your garter (usually 4-5 inches above the knee). Make sure your measurement is a snug fit (how you would like the final garter to fit on your thigh). Please select the exact measurement from the drop down menu. Do not add or subtract any inches from your original measurement; we’ll make the adjustments to ensure a comfortable fit. 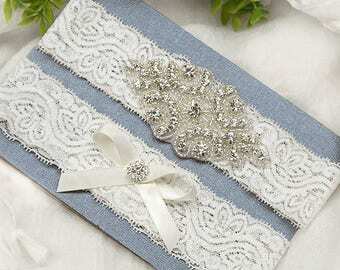 If you are purchasing the garter set, the toss garter will be made in the same size as the keepsake garter. 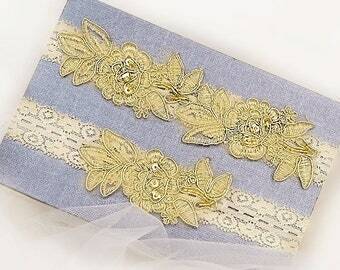 If you want the toss garter made in a different size, please let us know the size in the notes section at check out. 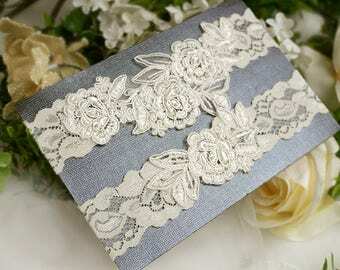 This is absolutely beautiful and goes so well with our wedding colors! I tried them both on to ensure a good fit. 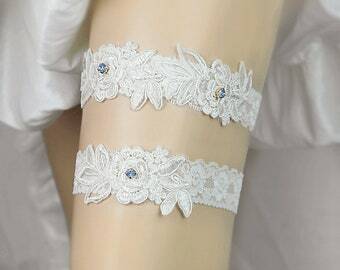 I am a full figure woman so this would probably be different depending on your size, but the keepsake garter fits well and stays up, the toss garter is smaller in width and it tends to roll down. 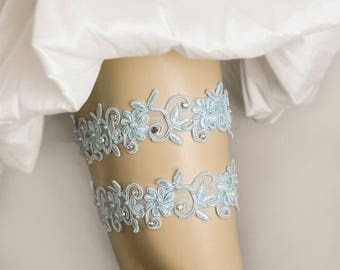 I still love them, and plan to put the toss garter on just before we do the toss, and also I plan to use some dress tape to hold it in place for the few mins that it will be on my leg. Both garters are absolutely beautiful and great quality! Perfect size and it’s not too small in width either. The keepsake garter has a grip on the inside of it so it definitely didn’t slip off. Payment can be made by credit card or debit card, using Etsy's direct checkout, or an Etsy gift card. California buyers are subject to local sales tax. I do not accept returns on custom items, and MADE TO ORDER items. Each piece is made to order and carefully inspected before packaging. Therefore, unfortunately, we are unable to offer refunds. If you can exchange it for something else. You can exchange your purchase within 7 days after receiving. Return products must be in the condition you received them and in the original box and/or packaging. Buyer is responsible for all shipping charges. We ship 1-5 business days after payment is received. We only ship to the address in your Etsy profile so please make sure that the address is current and updated. If the wrong address is provided and the package is returned to the sender, the buyer is responsible for the shipping fee to have it sent to the correct address. Once again, please make sure to double-check your shipping address. Kimsically is not responsible for lost, stolen or undelivered packages. No refunds will be issued if the address is wrong or for lost, stolen or undeliverable packages. If you are concerned about items being damaged, lost, stolen or undelivered, please consider adding insurance to your order (we recommend you to contact us for pricing). For U.S. Orders: All items will be shipped via USPS First Class Mail with tracking and delivery confirmation. Insurance is available for an additional fee (please contact us for pricing). If you need a rush shipment, please contact us for pricing. For International Orders: All items will be shipped via USPS First Class Mail (6-12 business days but can take longer depending on customs in your country). Also, no tracking is available for this shipping method. Express International shipping (3-5 business days with tracking) is available at an additional cost (please contact us for pricing prior to making your order). Orders shipping outside of the U.S. may be subject to customs duty or fees which, as the buyer, you will be responsible for it. We are not responsible for any delays and/or any other shipping and deliveries related issues that could occur.